* You can also substitute whole wheat flour or rye flour for some of the bread flour. Prep Day: Lightly grease baking pans, baking sheet, or muffin pans; set aside. In a large bowl or in the bowl of a 5 quart stand mixer, combine all the ingredients in the order given except the Egg Glaze. Using a dough hook, mix everything together until a soft dough forms. Turn the dough out onto a lightly-oiled surface (I use a nonstick cooking spray), and knead until elastic, approximately 10 minutes. Cover the bowl with plastic wrap and let rest for 10 minutes. For 16 small rolls – weigh dough into 2-ounce pieces. For 13 large rolls – weigh dough into 3-ounce pieces. As you roll the dough balls, keep the rest of the dough balls covered with plastic wrap so they don’t dry out. After shaping, place the dough balls, evenly spaced, onto the prepared greased pan. At this point, the rolls can be covered with plastic wrap and frozen. Once frozen transfer to a plastic bag, this way you can bake up just the quantity you desire for dinner and not the entire batch. Eat within one month. 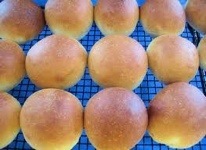 Serve Day: Before baking, allow rolls to thaw completely and rise in a warm place if frozen. I have found that I have to take the unbaked frozen rolls out of the freezer 3 to 4 hours before planning to bake. I just put the frozen rolls (container and rolls) on my counter (not in the refrigerator) and let thaw and rise. In a small bowl, combine (whisk together) egg white and water. Just before baking, brush the top of the rolls with the Egg Glaze. Preheat oven to 375 degrees F. Brush rolls with Egg Glaze. Bake 15 to 20 minutes until they are a light golden brown.